A large volume of agroforestry waste is one of the global environmental problems of our time.1 The waste tends to accumulate in water sources, resulting in pollution such as unpleasant odours, eutrophication, high levels of biological oxygen demand and chemical oxygen demand.2-4 In response to rising costs associated with waste disposal and increasing environmental demands, the sustainable conversion of wastes into useful products is becoming increasingly important.5-7 Conventionally, agroforestry wastes are disposed of by thermal treatment, landfilling and decomposition.1 Despite numerous means of disposal, these wastes still have adverse impacts on the environment.6 Thermal treatment processes involve combustion which results in gaseous emissions (CO2, CO, CnHm, SOx, NOx, ashes, etc. ), many of which are greenhouse gases; combustion is therefore a controversial method of waste disposal.8 On the other hand, landfill waste management commonly results in environmental odours, emission of greenhouse gases - CH4 and CO2 - and pollution of both underground and surface waters.9 The quest for environmentally friendly and sustainable ways of disposing of carbonaceous wastes, such as agroforestry wastes, has triggered research focusing on their potential as raw materials for the production of activated carbons. Although numerous studies have been devoted to investigating the potential of various agroforestry wastes as sources of AC,11,13,14,22,23 each particular material and method of production deserves special attention before any commercial viability is recommended. This specificity is necessary because both the raw material and the activation process determine the quality and the cost of producing the ACs. Currently, coconut shells are typical agroforestry residues used commercially in the production of activated carbons intended for drinking water treatment.14 The abundance of agroforestry waste makes it a potentially cheaper raw material for production of AC. Single-step steam pyrolysis, by virtue of its simplicity and low cost, is one of the most appropriate technologies for this purpose in developing countries. The aim of the present study was to evaluate the potential of converting agroforestry waste to commercial-grade AC, as an economic waste-management measure, using the low-cost single-step steam pyrolysis process. A total of 5 kg of each of pine (Pinus contorta) cones (PC), Abies (Abies cilicica) seeds (AS), maple (Acerginnala) seeds (MS) and peach (Prunus persica) stones (PS) was collected around Roma, about 35 km southeast of Maseru, Lesotho. The raw materials were thoroughly cleaned by scraping off surface adherents and washing in distilled water before drying in an oven at 60 °C for 24 h.
Production of activated carbons was done following the method described in Hapazari et al24. The dried raw materials were carbonised and activated using single-step steam pyrolysis. Samples (250 g) of each material were crushed into small pieces and placed in a stainless-steel tray (22 cm x 15 cm x 10 cm) and inserted into a size 1 Gallenkamp box furnace (Griffin and George Limited, Leicestershire, England), fitted with a regulated steam generation system. Steam was generated by injecting water into the furnace at a rate of 20 mL/min, starting when the furnace temperature was at 100 °C until the end of the soak period (30 min). Softer raw materials (MS and AS) were treated at 500 °C while harder raw materials (PC and PS) were treated at 800 °C. The treatment temperatures were selected to ensure minimum ashing and good adsorption properties of the ACs. At the end of the soak period, samples were allowed to cool in a furnace to 100 °C before removing the ACs for washing. The ACs were washed with distilled water for 30 min at 60 °C to remove ash, then dried in the oven at 60 °C for 24 h and weighed. The ACs were then ground to powder and sieved through an 80-mesh (0.177-mm) sieve. 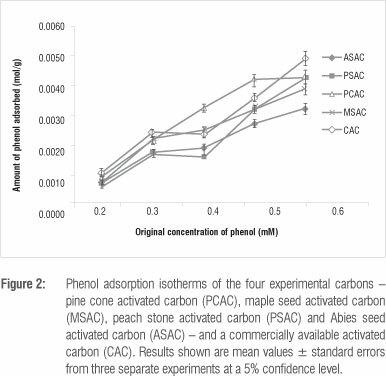 The four experimentally produced ACs and a commercially available activated carbon (CAC) were characterised according to five parameters: phenol adsorption (which reflects the surface area of AC), iodine number (which indicates adsorption capacity), pH, ash content and moisture content. Equation 1, where qe is the amount of solute adsorbed on the carbon (mol/g); Ce is the equilibrium concentration of solute (mol/L); qm is the Langmuir monolayer coverage constant (mol/g) and b is the Langmuir adsorption coefficient. qm and b can be derived from a linear plot of 1/Ce against 1/qe. Slurries of the ACs were prepared by adding 0.2 g AC samples to 100 mL distilled water in 250-mL flasks, and shaking at 200 rpm using a shaker (Vacutec Cat N° 10 x400xx2) for 2 h under ambient conditions. The slurries were filtered and the pH of each filtrate was measured. For ash content, 2-g samples were ashed at 900 °C for 12 h in a furnace (Gallenkamp box) and the residue cooled to room temperature in a desiccator. The ash content was calculated as the weight ratio of the residues to the original sample. 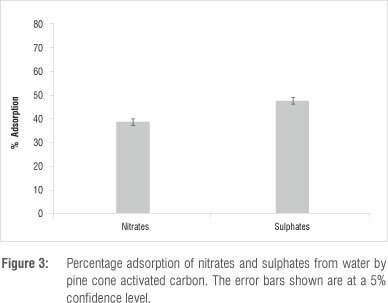 Pine cone activated carbon (PCAC) was used to investigate the effectiveness of the experimental ACs for the removal of metal ions (Cd (II), Cu (II), Hg (II), Mn (II) and Pb (II)), nitrates and sulphates from water. The selection of PCAC was based on its superior performance, in terms of adsorption properties, compared to the other experimental ACs. For sulphate determination, calibration standards were prepared from sulphate solution stock ranging from 10 mg/L to 80 mg/L sulphate. The standards were then used to plot a calibration graph. A photometer (Spectronic 20 Genesys, Burlington, USA) was used to measure turbidity of the sulphates in the samples. A sample (100 mL) was mixed well into an Erlenmeyer flask with citrate buffer solution (20 mL) using a stirrer at constant speed. While stirring, a spoonful of barium chloride was added, after which stirring continued for 60 s. After stirring, the solution was poured into an absorption cell of the photometer and turbidity was measured at 450 nm. The concentration of sulphates in the sample was then calculated from the calibration curve. The removal of metal ions - Cd (II), Cu (II), Hg (II), Mn (II) and Pb (II) -from water by the PCAC was determined using a flame atomic adsorption spectrophotometer (FAAS). All the adsorption experiments were carried out in triplicate using a batch adsorption technique. For each metal, a stock solution of metal ion concentration of 1000 mg/L was prepared by dissolving equivalent amounts of analytical reagent grade metal salts (CdCl2.H2O, CuCl2.2H2O, HgCl2, MnCl2.4H2O and PbCl2) in 250 mL deionised water. Experimental solutions were prepared by diluting stock solutions of (1) five single-element solutions of 50 mg/L metal ions and (2) a multi-element solution containing 7.14 mg/L of each of the metal ions. Approximately 0.1 g of PCAC was added to each of the six flasks containing 100 mL metal-ion solutions and continuously shaken for 3 h at room temperature. After the adsorption step, the aqueous phase was filtered through Whatman No.1 size 15 filter paper and the final concentration of metal ions was determined by FAAS (Varian Spectra AA-100, Melbourne, Australia). Determinations of concentration were carried out in triplicate and standard errors were calculated for all results. Data obtained for the removal of metal ions were analysed by SPSS (version 16.0) using a one-tailed Student t-test to determine differences in the removal of metal ions between single- and multi-element solutions. p<0.05 was considered significant. Each of the ACs has its own characteristic properties and variation exists in the efficiency of removal of a range of impurities from water or any other media. Characterisation of the carbons is important in the formulation of a consistent quality carbon applicable for specific uses. Ash contents for PCAC, MSAC, PSAC and ASAC were 3.03%, 3.90%, 3.03% and 5.35%, respectively (Table 1). The ash content is directly related to the pH of AC and the measured pH values were 8.43, 8.64, 8.58 and 9.76, respectively. A basic pH is expected because the ash consists mainly of salts and oxides of the chemical elements dominating plant tissue, including calcium salts, alkali carbonates and silica. Fe, Al, Mn and Mg are present in small amounts. The pH values are fairly comparable to pH values reported by Budinova et al.31 for ACs from olive seeds, coconuts, cherry stones, peach stones, apricot stones and Moringa husks, which ranged between 8 and 12. High pH values are indicative of soluble inorganic material, which, for specific uses such as medical and pharmaceutical applications, may need to be removed for the carbon to be used. Adsorption isotherms (Figure 2) were used to assess the adsorptive capacity of carbons by estimating the surface area available for a monolayer of a molecule of phenol. A higher phenol specific area indicates a large micropore volume of the carbon. The phenol specific areas ranged between 318 m2/g (for PSAC) and 415 m2/g (for PCAC). The shape of the adsorption isotherms can provide preliminary qualitative information on the adsorption mechanism and on the porous structure of the carbons. At low phenol concentrations, less than 0.3 mM, all isotherms present a sharp increase typical of adsorption taking place by primary filling of micropores. Between 0.3 mM and 0.4 mM, curves exhibit a levelling off (or adsorption equilibrium), presumably marking the end of primary filling of micropores. Above 0.4 mM, the curves increase sharply again, which presumably shows the onset of secondary filling of super-micropores. Based on the shape of the graphs in Figure 2, the characteristics resemble Langmuir isotherms, also reported by Ntuli18, Okeola and Odebunmi33 and Aloko and Adebayo.34 The surface area of AC is generally proportional to its adsorptive capacity. Surface area is dependent on the mass removed during activation of the carbon, which creates pores in the material. The surface of AC is also influenced by the ash content of the raw material. A high ash content is indicative of high levels of non-carbonaceous matter (impurities) that tend to block the pores during activation, thus lowering the surface area. All raw materials used in this study exhibited low ash contents, which are ideal for attainment of large surface areas in their AC derivatives. 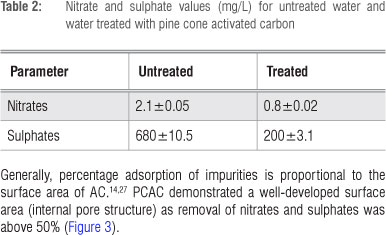 Generally, percentage adsorption of impurities is proportional to the surface area of AC.14,27 PCAC demonstrated a well-developed surface area (internal pore structure) as removal of nitrates and sulphates was above 50% (Figure 3). The high adsorption capacity shows that PCAC has a potential application in waste water and water-treatment plants. The same can also be said about the other experimental carbons because their adsorption characteristics are closely comparable to PCAC, albeit slightly lower. Although we did not investigate the parameters known to influence the adsorption process, such as contact time, pH and adsorbent dose, the results still present a positive illustration of the capacity of the tested ACs to adsorb metals from water (Figure 4). 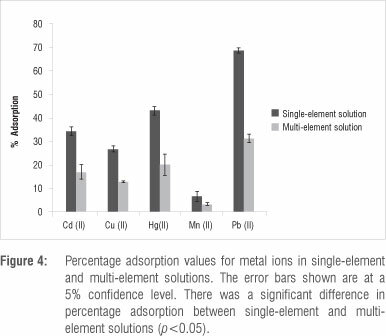 The differences in percentage removal of specific elements from single-element and the multi-element solutions can be attributed to the competition for active sites by the elements. In a single-element solution, only one element is available for adsorption by the active sites, while in a multi-element solution, the five elements compete for the active sites for adsorption at constant adsorbent dose. This competition resulted in significantly lower percentage adsorptions (p<0.05) from the multi-element solution than from the single-element solutions. 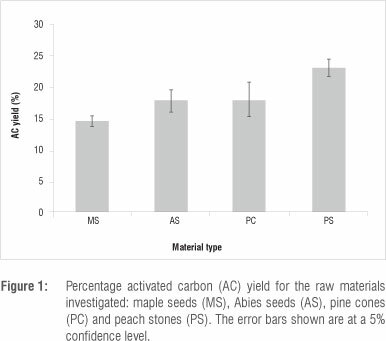 We demonstrated the technical potential of using a combination of agroforestry wastes and the single-step steam pyrolysis technique to produce activated carbons of acceptable functional properties. We also envisaged that the application of such a process at an industrial scale could contribute towards agroforestry waste reduction in the environment as well as deliver economically competitive ACs. On the basis of AC yields, the use of PS gave a commercially viable yield of 23.0% (above the commercially recommended lower limit of 20%). Two other raw materials - AS and PC - gave yields of 17.8% and 18.0%, which were scattered around the 20% minimum limit, making them also promising raw materials for commercial production. All the investigated agroforestry wastes gave ACs of good quality based on the analysed characteristics. The ACs were by and large suitable for drinking water treatment, as well as any other application of comparatively less stringent requirements. This research would not have been accomplished without the Research Grant provided by the National University of Lesotho. We also thank the Department of Chemistry & Chemical Technology and the Department of Biology for the provision of laboratory facilities and various other forms of support. V.N. and I.H. contributed equally to the experimental design, data collection and writing of the manuscript.